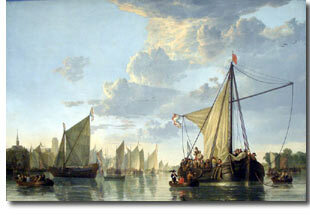 The glowing painter of Dutch landscape, the sunny-hearted, was Aelbert Cuyp (1620-1691). The calm, and brightly lighted countryside, the atmospheric effect of hazy mornings, the golden mantle of eventide, warm summer skies reflected in an expanse of water overspread with sailing craft, or the polders and meadows near his beloved Dordrecht he loved to paint these, and did it masterly. So many-sided was his talent, that the cattle he placed on the sward raised him to foremost rank among animal painters. And when in early years he painted still life, game, fruit, and fish, he showed a skill, a refinement, a feeling for texture and colour, which places him above any of the artists who devoted themselves, exclusively to such themes. But in landscape he excelled, with such simplicity, such lack of pretension or effort, such happy, un­studied combinations of arrangement, that his art must be considered almost equal to that of Ruisdael. Nay, it possesses at first even greater attractiveness, inasmuch as Ruisdael with his gigantic strength often produces a sense of gloom and solitude, while Cuyp with more poetic spirit leads our minds to light and joy. His works are pastoral poems. Learning from his father, he was soon independent and original, and expanded by the light of his own genius. Nevertheless, he was not at first recognized by his countrymen, and although some magnificent examples of his art are in the Netherland Galleries, many more are in foreign collections, notably in England.